A comic-grotesque fantasy in which Nekrotzar – a figure representing Death, the “Grand Macabre” of the title – menaces the pleasure-loving population of fictional Brueghelland, Gyorgy Ligeti’s only opera was premiered in Stockholm in 1978 and enjoyed a high degree of success in its original form. Nevertheless, for a production mounted at the 1997 Salzburg Festival, Ligeti was persuaded by Peter Sellars – so the director informs us in his Barbican programme note – to make substantial revisions, and it is the revised version that conductor Simon Rattle, together with the London Symphony Orchestra and Chorus present in this semi-staging by Sellars himself. What Sellars does not tell us, however, is that Ligeti (who died in 2006) was extremely unhappy with Sellars’ 1997 production; he even threatened to sue. Though it’s clearly not the same piece of work, there’s no doubt that by once again focusing throughout on the dire consequences of nuclear wars and nuclear accidents – there’s a visual history of nuclear explosions on a video map of the globe, while the Chernobyl disaster is referenced again and again – Sellars turns the absurdist original into something far darker and more menacing; real though Sellars’ concerns may be, Ligeti’s opera has been comprehensively re-angled to accommodate them. 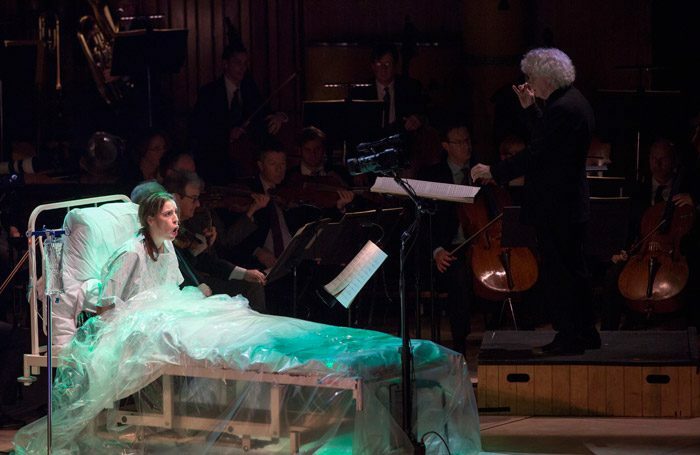 That said, and given the usual problems involved in trying to fit a 55-piece orchestra plus a limited staging onto the Barbican Hall’s none-too-ample platform – the highly disciplined chorus sings from various parts of the auditorium – this is a serious enterprise carried off with skill and musical precision. Rattle is in perfect control of one of the most significant scores of its period – now nearly forty years ago. The cast is admirable, with accomplished standouts from Peter Hoare’s Piet the Pot, Ronnita Miller’s vocally luscious Amando, Elizabeth Watt’s focused Amanda, Pavlo Hunka’s commanding Nekrotzar and Anthony Roth Costanzo’s flippant Prince Go-Go.